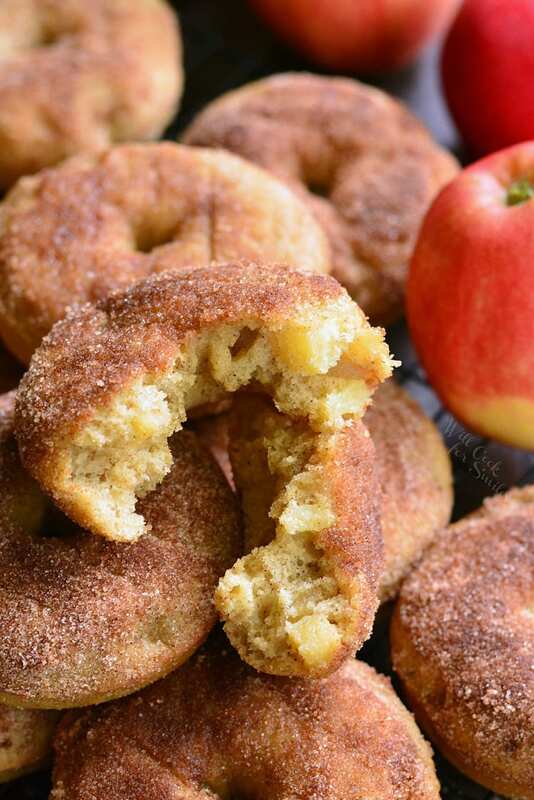 Soft, flavorful baked doughnuts that come with a whole lot of fall happiness in every bite. 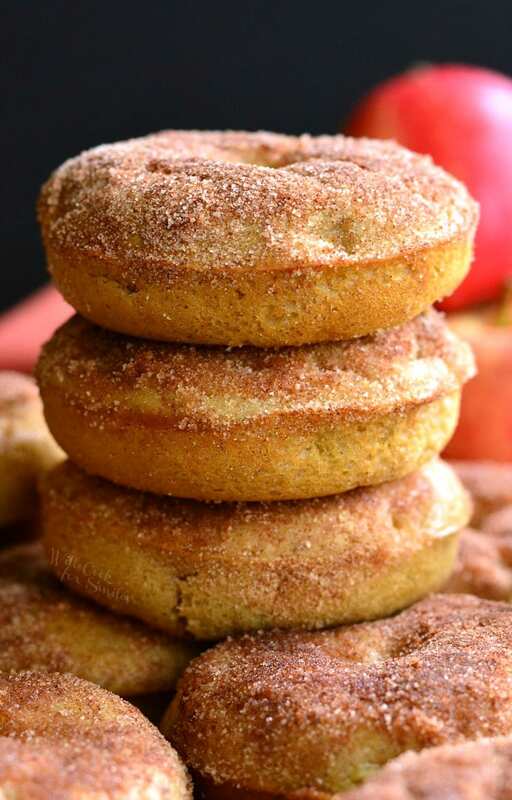 These delicious cake-like doughnuts are made with apple pie filling throughout and topped with some cinnamon sugar mixture. I know that “officially” it’s not a fall season until September 22nd, but I am one of those annoying people who starts to think pumpkins and fall leaves on September 1st. It’s surprising that I wait that long because I wish fall would start in August. Fall is my absolute favorite season of the year and I can’t wait to watch some Nightmare Before Christmas, Hocus Pocus, and Beetlejuice while making a bunch of pumpkin and apple caramel treats. I couldn’t wait to celebrate the beginning of September, so I whipped up some delightful Apple Pie Doughnuts for my boy. They are just as thrilled for the fall season to be here because they love pumpkin and apple treats I always make for them. My little guy especially couldn’t wait for the start of the pumpkin season. 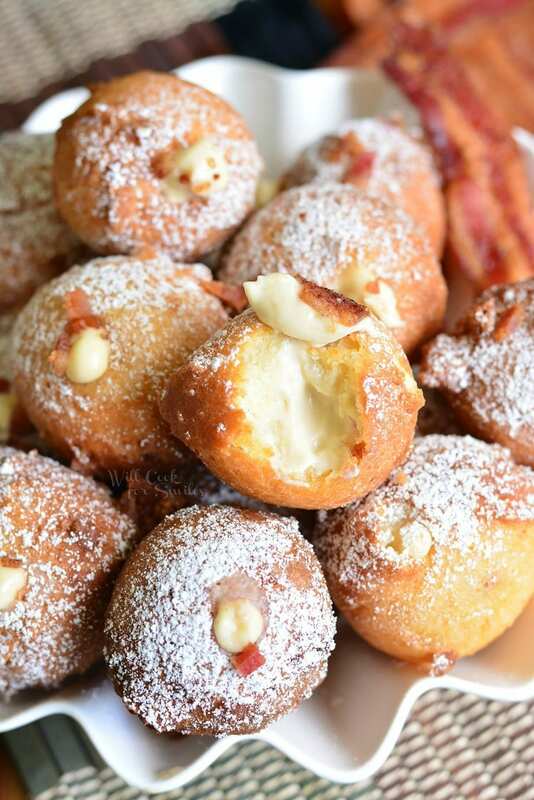 These doughnuts are really easy to make too. 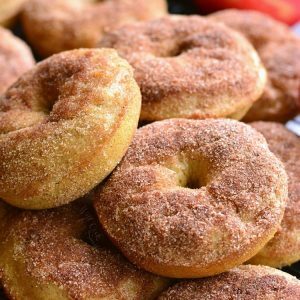 Baked doughnuts are always so quick and easy, you will be feasting on cakey, apple cinnamon deliciousness in about 40 minutes. Although, you may want to let the first batch cool and not burn your mouth like we always do. When it comes to cookies and doughnuts, we can never seem have any self-control to wait for them to cool down. 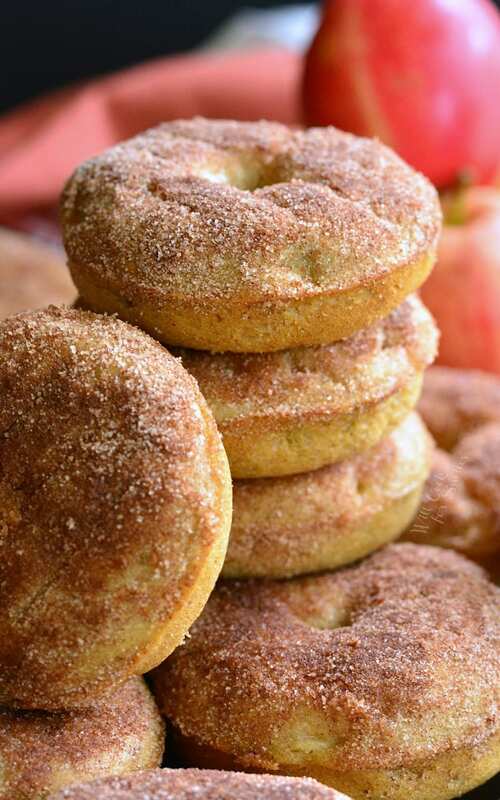 These delicious cake-like doughnuts are made with apple pie filling throughout and topped with some cinnamon sugar mixture. Heat up a sauce pot over medium heat. Add butter and sugar, mix well. Add diced apples and apple pie spice. Mix well, cover and cook until apples are softened. Take off the lid and stir in flour. The mixture will thicken. Mix and cook for about a minute. Take off heat. Preheat oven to 350 and grease a doughnut pan. In a large mixing bowl, whisk eggs, sugar, buttermilk, melted butter and vanilla together until smooth. Cut the tip off both piping bags, leaving only about 3/4 inch opening. 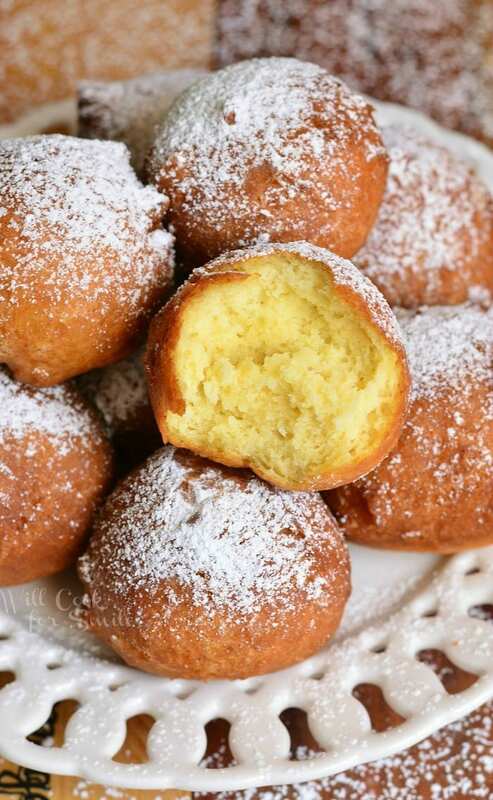 Squeeze batter into the doughnut cups of the pan, in the half-circle motion. 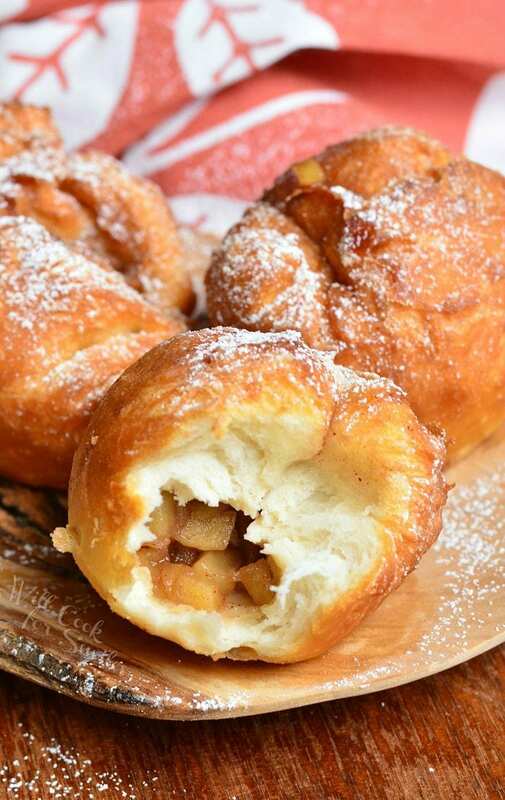 Make sure there is an even amount of batter all around. Bake for 11-12 minutes and let doughnuts cool on the wire rack, just until the doughnuts cooled enough to be handled. Melt butter in one little cup and mix sugar and cinnamon in a shallow bowl. 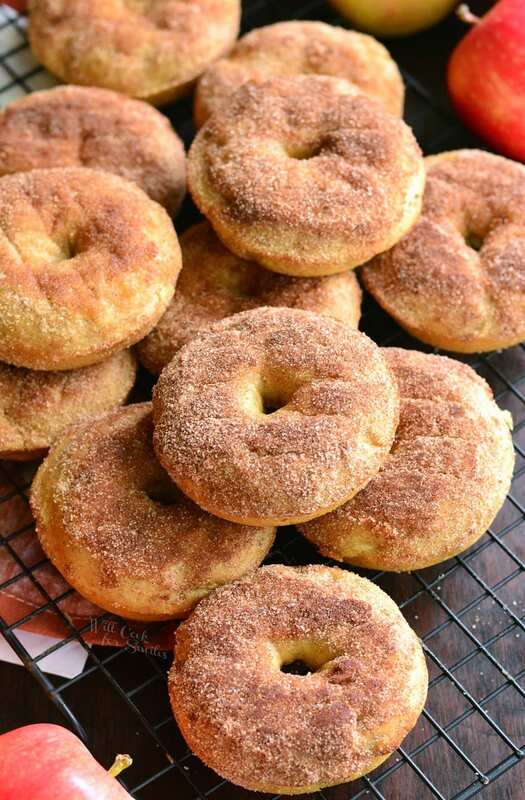 Brush the top of the doughnut with a little butter and then dip it into the cinnamon sugar mixture, cover it evenly. Place back on the wire rack and repeat with all doughnuts. Will apple pie filling in a can work too? I have a can in my pantry if it works. These sound great! I don’t have a doughnut pan, so I may try making them in a muffin pan. Good Idea Angie!!! I was thinking I would stir all ingredients together & make in a loaf pan. I think the muffnis would be great though. It all lookes so tempting!!! Hey Lyuba…! your apple pie is amazing and delicious and looks so yummy. Thanks for the sharing this recipe and keep share your new ideas. hi lyuba…! your dish looks so delicious and yummy, i will make it like you form your recipe. Thanks for the sharing and keep shared your amazing ideas and recipes……! Thank you, Sunaina! I hope it goes well. 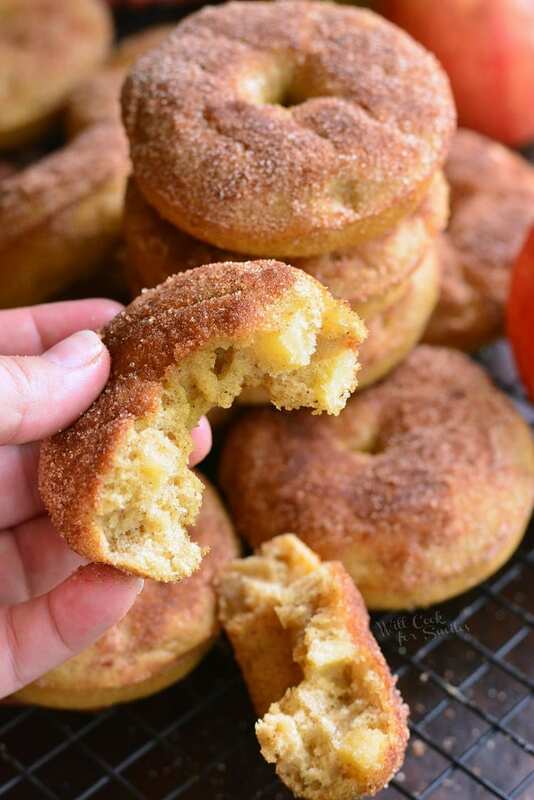 Love these apple pie baked doughnuts! Very nice snack. looks delicious. and healthier as well. 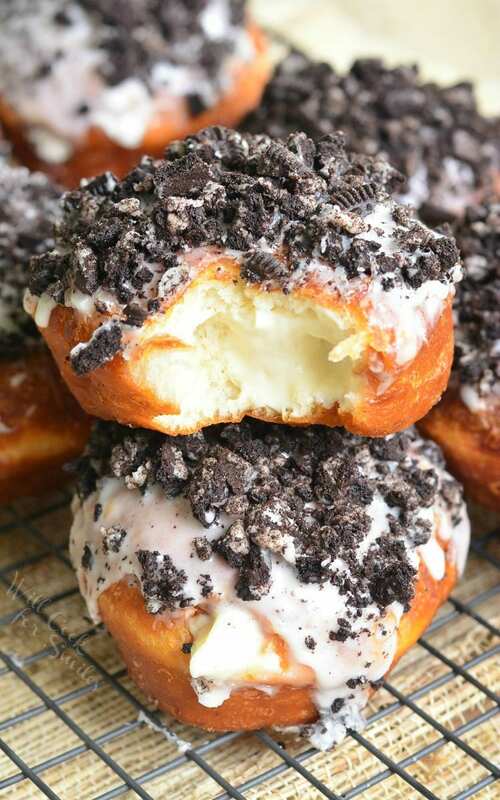 How many donuts will this recipe make? I’m very excited to try it! I loved your content, I’m happy to have such content. How many will this re ipe make? Hi Lori! Thank you for checking, for some reason the recipe didn’t carry it over from the old format. It makes about 14 doughnuts. Hope you enjoy them! Love this recipe. Tried to sign up for email but says no longer available. Can you tell me where you clicked on the link that was no longer available? I want to fix it but the links I’ve tried are working. Which one did you click? Hi, it was 1 of the bits at bottom on this page but I tried there and was able to sign up. Oh yes! Found it and fixed it 🙂 Thank you! Can you use canned apple pie filling? It depends on the filling, you would just have to watch how thin it is. If it’s pretty juicy or thin, try to strain off any syrup or juices. You don’t want to add any liquid to the batter or it will be too runny. If you can see, I add flour when making the apple filling to make it nice and thick so that there is no additional liquid to the batter. What is “Apple Pie Spice”? thanks for the perfect recipe! I was wondering if the dough could be made, put into a pastry bag, refrigerated and baked inthe morning? I would love to bring some warm doughnuts into work my co- workers. This dish is delicious, thank you for sharing, I will do it when I have free time.